The 31 mile course is a mix of technical single track, horse trails, country roads & the D&R canal path. 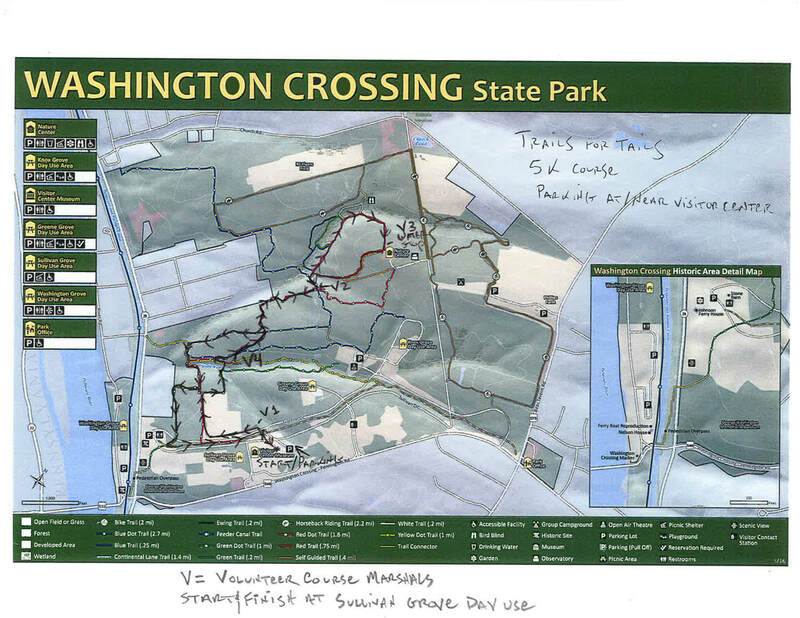 The Race starts in the Historic Washington Crossing park in Hopewell Township, NJ. 8 hour cut off. The 50K is one loop with a great mix of trails and only 3 miles of back county roads. ​and Peanut M&M's. In addition, Enhanced Aid Stations will include PB&J Wheat and hot food offerings. The specific cut-off for the 15K is completing the 1st 4.6 mile loop in 1:10. The 5K (starts 2 hours after the 15K start) and you will need to be at the start line for the 5K at 9am. The 50K, the third leg starts at 9:55am. The cut-off for the 50K is 8 hours. 50K course map will be posted soon. Fallen trees will either be cleared before race day or have a round about.